Rich, velvety, fluffy, moist, and chockful of apples and cinnamon, these muffins are a decadent treat for breakfast, brunch, or whenever. They are quick and easy to make, using a standard wet-to-dry ingredient method. The wet ingredients, which contain the cream cheese, will be lumpy after mixing: don't worry, it's just lumps of cream cheese that will melt into sweet, creamy, and moist pockets after baking. A bit of lemon juice in the batter somehow seems to enhance the creaminess. 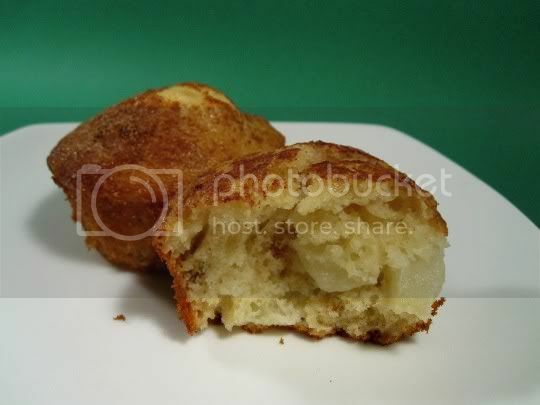 Bran flakes in the batter give the finished muffins a chewy texture, and the chunks of apple are soft, juicy, and sweet. And the muffin topping is so simple, but absolutely amazing. A generous sprinkling of cinnamon (of course, the best apple pairing) and sugar take these muffins almost to a dessert level, and wait 'til you smell that cinnamon baking in the oven! Just one word of warning: wait til these muffins cool considerably before removing them from the pan (unless you're using muffin liners). They are so moist that they might fall apart if you remove them too quickly. I know this, of course, because they smelled so amazing that I couldn't wait to eat them! Make again? Definitely. This should become a tried-and-true recipe for all. Vegan variation: Use egg replacer, soy cream cheese, soy milk, and vegan butter.